Loyola celebrated All Saints Day with a school-wide liturgy in Xavier Center on Tuesday, Nov. 1. The Most. Rev. 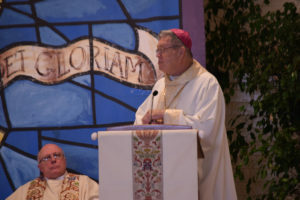 Bishop Edward W. Clark presided over the Mass along with Deacon Derek Brown. Bishop Clark delivered the homily to the Loyola community. Sophomore Sebastian Kuhr commented that Bishop Clark made his Mass experience through his enlightening homily. “The bishop was there to guide us spiritually through the mass and support us as one unit,” said Kuhr. The addition of Bishop Clark was the first time a bishop presided over a school-wide mass at Loyola since the Mass of the Immaculate Conception in 2014.